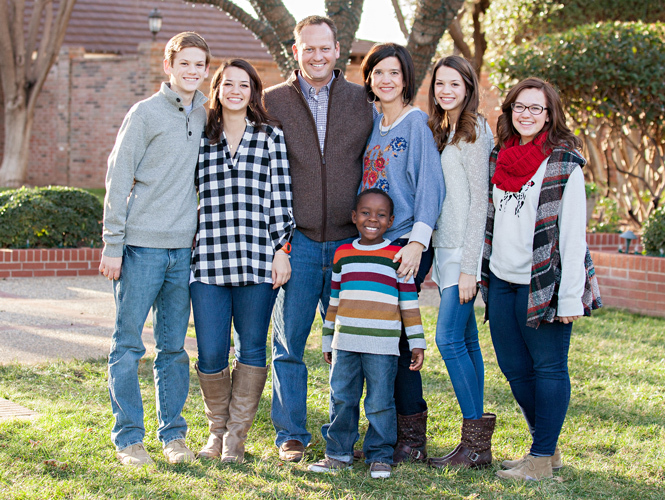 Alan and Holly Brown are pictured with their children (from left) A.J., 15; Annie, 17; Abby Claire, 15; Allison, 19, a sophomore at ACU; and Moses, 5 (front and center). Enjoy their story, as we continue our series about Abilene Christian University alumni who have followed their hearts to adopt. Alan is co-founder and general counsel for FireWheel Energy, LLC, and Holly is a stay-at-home mom. They live in Midland, Texas. It all started with an essay. A simple sixth-grade essay with the title “Why My Family Should Adopt.” Our daughter Annie came home one day and boldly held out her latest work and pleaded for us to read it. It was well written and smartly organized with thoughtful arguments to address every question we might have. How could we argue with her logic? Great house with extra room, good job, four siblings who would love and care for him, and a mom and dad who loved the Lord and had faith that He would provide for us all. That one little essay started our family on a journey that took us to places we never could have imagined. God had something amazing in store for us, and He brought the vision to us through a little sixth-grade girl. Once we started down that path, everyone in the family was on board but Alan. He just wasn’t sure this was where God was leading our family. But Alan decided to spend some time with God in prayer for several weeks leading up to a big adoption conference. Alan’s unspoken fear was that our family was going so well and that adding a new child from another country would somehow mess things up. So God gently gave Alan the words, “Your life is so good; now go share it with another.” Something in those words broke things free in the spiritual realm, and Alan joined the rest of the family in anticipation of a sweet little boy who would soon be a part of our family. After months of waiting, the word came through that a little boy named Moses was going to be ours. We packed up the entire family, skipped the last week of school, and headed to Kampala, Uganda. When we walked into Loving Hearts Babies Home and saw Moses for the first time, our joy was indescribable. One of the most beautiful things was to watch our daughter Annie take him into her arms and tell him how much she loved him. God worked through her to bring Moses to exactly where God wanted him. It took four more weeks to get him home, but we loved every minute of our time getting to know the Ugandan people and culture. Moses has been home with us for two and a half years, and it is hard to remember what life was like before he came to us. His transition into being a full member of our family has been seamless. He has brought so much joy to our lives and for all those around us. When people talk to us about what a great thing we did for him, we feel almost guilty. He has given us so much more in return. We pinch ourselves sometimes at the thought that we get to raise this amazing young boy. So I’m thankful God knows each of us and exactly what we need. I’m thankful He speaks to us. And I’m thankful for a little sixth-grade girl who listened and had the boldness to speak.